Omnisphere, Virtual hybrid synth from Spectrasonics. Product replaced by the Spectrasonics Omnisphere 2. 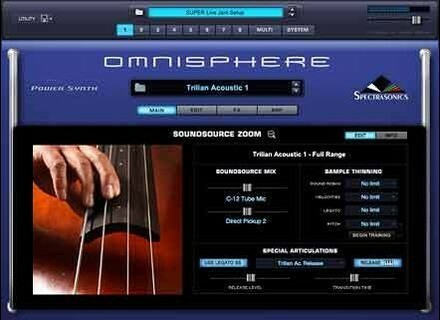 Spectrasonics has released updates for Omnisphere: Omnisphere Software v1.0.3f, Omnisphere Patch Library v1.0.3 and Omnisphere Soundsource Library 1.0.2. Over 2000 new Omnisphere patches. Major reorganization of Factory Patch Library*. Improved Categories/Tagging to make locating sounds easier. "Type" attributes added for all categories. Expanded edition of Omnisphere Reference Guide. Numerous enhancements to the Patch Library. Taste of Omnisphere demo library. Adds a fix for "Titanium Resonance Piano" Soundsource (updated version called "Titanium Resonator Piano"). Adds a fix for "Toy Spoke Piano" Soundsource (updated version called "Toy Spokes Piano"). Fixes loading problems with Distortion category. For more info, check out www.spectrasonics.net. UVI Workstation Updated to v1.0.14 Univers Sons / Ultimate Sound Bank have updated UVI Workstation to v1.0.14. Native Instruments [Kore Soundpack] Acoustic Refractions This new Kore Soundpack has sampled material with advanced processing in Kore, Absynth, and other sound engines included in Kore and Kore Player. Parking B Releases Zweeger v2.0 (Beta) Parking B has released a first beta version of Zweeger v2.0, which is a free modular extended MIDI filter and generator.